He woke up with splitting headache. His dreams were dark and confused. He opened his eyes, slowly, as if afraid of what he could see. He didn't know where he was, he realized. He was... no not Althran - Alcaran, Alcaran Nenuvar, the Stray Ray of Light on the waters of the Sea of Dreams. "My Lord?" someone's hesitant voice disturbed his thoughts. He looked in the direction of the voice. 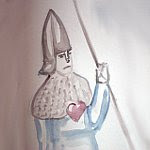 A man in silvery white ithilmar armour stood at the side of hid bed. He knew him. Iarvain, the Swordmaster. His bodyguard. "What happened? Where am I?" He groaned as he sat up. The headache just wouldn't give up. "Spider bite." said the Swordmaster. "Everything is poisonous on this blasted island," another voice growled. Alcaran gazed into the gloom of the chamber and saw a second figure seated in one of high backed chairs. Cal... Caladris? No, Calandil, the Life mage. "Island?" he asked, feeling stupid. "Yes." said the mage dryly. "Island of Blood." "Now, if you would pull yourself together? We have a battle to fight." Well, this is more or less exactly how it begun. I never planned on playing Warhammer. It just happened, about year and half ago. Some of my friends roleplayed Warhammer and from time to time they played battle or two to see what happened in the roleplay. And they talked us into it (us means me and my husband, who chose the treacherous IoB Skaven). We had about a month and half to paint the units and almost no idea how to do that. Without further ado, this is what I came up with. Swordmaster standard (the Gleaming Pennant was added later, it was gifted to the unit by Prince Alcaran in reward for saving his life in battle). Sea guard, the crew of Isha's Grace. I couldn't get the white quite right, so I washed the recesses blue. Reavers. They were the las unit I painted, there was so little time I nevere finished them as i wanted. And never got back to them. And finally, the Lord Alcaran Nenuvar himself. And yes, he remembered how to ride a griffon - at the very last moment. Not a legal army, points wise, but the reingorcements will come soon enough. The battalion comes next and some... White Lions! Last edited by Aicanor on Tue Jan 14, 2014 9:03 am, edited 47 times in total. You have done some nice detail work here so you obviously have some decent brush control. The colours look a bit flat to me though. I would try using a few different tones on some of the parts or employ some washes. This might help give the models a bit more depth. I like the colors, it's a nice arrangement of pastels. Almost feels oriental, which isn't something I've seen in HE before. Well done! They look fantastic to say the least. You obviously have that artists touch.. I'm particularly fond of the golden highlights on there blue tinged armour. 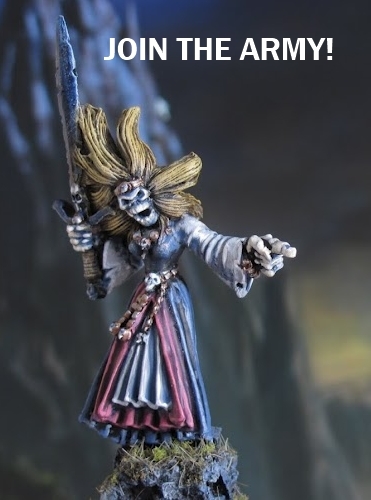 I'd also suggest the slight use of washes as noted above, using some watered down into recesses or areas of high shadow will add the depth and tones that would really bring your models to an even higher standard. First, thank you all for your comments. I am glad you like my addition to the Host! I would try using a few different tones on some of the parts or employ some washes. This might help give the models a bit more depth. I was still grasping the concept of washing and shading at the time I painted these. Hopefully I will get back to them and do that one day, but there is so much to paint... I used white undercoat, which makes some colours easier to paint, but it is harder to get deep shades. And I am glad you do not mind me stealing "the Rainbow" from you. I didn't have that in mind, but I like it. It is in fact a kind of metallic glaze (even if I didn' know it at the time). My sense of humour gets the better of me from time to time. I painted this Banshee for a friend who played VC briefly. In the darkness somewhere last of the Dwarves fought a desperate battle to save the Karak and he lent them what strength he had left. All of sudden, there was a flash of green light and the archmage sank lifeless to the ground. He didn't feel anything as the remaining Swordmasters picked him up and carried him away from danger. This battle was true nightmare. It is just no fun to fight a battle against Ogre Iron Guts in narrow tunnels of old Dwarven keep. Note: Leave it to the Dwarves next time. Dinner after the battle was a pleasant occasion, discussing how cheesy and lame it is to use a Shadow level 4 in a thousand points army. And about how magic is fickle and achieved nothing in the end. I smiled and inwardly sang a dirge for the venerable old art of logic. And so it was a got first taste what it meant to be a High Elf general. The good thing was I painted some more troops for this event. The White Lion Chariot coming next! Oo, I like a lot! Very nice and colourful. Lovely freehand too. Only criticism is that the White Lion on the far right looks like he's falling over. And yes, I always use an Archmage at 1000pts. ...the White Lion on the far right looks like he's falling over. I will tell him to stand straight next time I take pictures. It was one disaster of a battle. Morale: Never play anything that includes long narrow underground corridors. Historically, it never proved healthy for us. I suspected I was not the only one. Archmage Tinwal smiled as he watched the white beasts crush and tear through the ratmen, leaving nothing but bloody mess behind. Shimmering light of life magic enveloped the lions as they made their way through crumbling enemy lines. Well, T7 Lion Chariot IS a monster. Thanks! My Elves will keep the title then and wear it with pride. Great, I love the White on the White Lions . Also your freehand is really excellent. Only thing I don't like is the golden lion shoulder pad. It's a White Lion head, I'd say, not a model. Still, the rest is great. Nice sig too. I certainly need magic to live. We have a dog this white, I painted the Lions after him. You are right with the shoulder pads, I did it because new Lions have metal ones and I wanted them to look similar. A mistake probably. I am working on Korhil and painted it lion white. I am considering using the model for a WL unit filler but I am not sure it is a good idea. I need it as well. Fortunately in real life magic doesn't cause detonations. At least not in literal sense. Archmage Tinwal looked over the battlefield. Across the river he could see regiment after regiment of Druchii warriors and treacherous Ratmen. He hid his fear and self doubts deep inside. Everyone here seemed to think of him to be cold, haughty and aloof anyway, so no one will hopefully notice. He got the job of high general in the best elven fashion. Politics. Truly, who else could possibly hold Elves of Athel Loren, Dwarves and old Nehekharan King together? Not one of them was friendly and forthcoming to the others. But the army at their door was able to make them work together at least for the moment. And he lead them into the battle. Yet he was a bit uneasy, they were all more experienced generals than he was. At this moment he hated politics. Silent as ghosts, the Phoenix Guard joined him at the front of their joined armies and he felt slightly reasured. He will survive the battle, and so will his men. Horns and drums sounded from the other side of the river and the enemy moved forward. Druchii Beastmasters cracked their whips and terrible black Hydra moved in front of their advancing troops. We played invasion and quite like my Archmage, I was made the general of Order for the sole advantage of being acceptable for all sides. So we watch Skaven and DE cross the river (I wanted to see what river does in battle - now I know - it makes people angry). "We should advance," I say. "No, not yet." Ok, so we stand and Dwarves shoot cannonballs at the Hydra. "Should we not advance to hold enough parts of the battlefield?" "No, not yet." So we play. End of fourth turn Wood Elf general announces he has to go home and the Dwarf departs with him. Now TK control their quarter of the field against rats (with no warmashines by now) and the other seems a bit emtpy with my HE standing against the hated Druchii. But finally I see what I need to do and advance. Four turns later the HE still stand proud and hold other quarter of the field against their dark kin. The DE player then figuratively throws away his army (gifted it to one of other player). next three hours we hear about how bored he was, how lame it was to place the river across the battlefield and how he did hardly get into close combat (well, he was welcome to charge his Xbows into my WL instead of shooting them from afar ). I suggest it would perhaps be better to play a few one on one battles to help us new players to get better understanding of our armies. He was offended that we disregard his RPG campaign. Oh well. After some more discussion we started Mighty Empires campaign, but it proved to be short lived as my friend finally realized he was bored to tears by us and all fantasy WH and started a 40K campaign. I am not falling for the same trick twice. Sorry for the rant, but this is how I started in Warhammer and I suppose I had to write it up to get rid of the bitter taste. I will only add the mangled Dark Elf army arrived eventually at my door and now to the models. I hope they will make up for the lenghty intro. Laimar, the BSB in this famed battle. The standard doesn't look like much, but it is ancient. Next time I plan to visit the Shadowlands. But before I venture there, my homage to Lileath. Last edited by Aicanor on Mon Feb 27, 2012 5:52 pm, edited 2 times in total. Nice work Aicanor, the RBT looks serious in black and gold, the PG came out awesome and those DPs look great, you'll need to do something thematic for that banner. Your banner work is awesome! Is that freehanded straight on to the banner or do you have a few practice goes first on paper? I always struggle with banners, putting paint onto a 2d surface stumps me! Thank you both for your praise! ...you'll need to do something thematic for that banner. Very true. Now I just have to figure out how the dragon should look. Is that freehanded straight on to the banner or do you have a few practice goes first on paper? I am no master of freehand, but perhaps I can put together a few guidelines I try to follow when painting. The design should not be overly elaborate. Banners are meant to be recognizable over long distances after all. Once I have an idea what to paint, I start with paper and coloured pencils. I try the design out to see how it would come out. When I am happy with the sketch, I paint the outlines onto the banner (even fine pencil lines would do). I try to keep outer lines as tidy as possible, the inner ones do not matter that much, they will be painted over. The outer ones can be smoothed out later. From then on it is a matter of patience. I am slow painter and it takes me hours to finish a banner. Ahtaril watched somewhat wistfully as the repeater crossbow charred in the campfire. Sometimes he caught himself thinking it should be put to better use against its own crafters. Yes, that would be nice. He smiled and then shook his head. No way. He will never give in and use something a vile Druchii held in his hands, no matter how useful it could be. To put the temptation out of his mind he looked away from the fire. Nirwain Nightwalker, sat at the edge of the clearing. Lights and shadows flickered over his face. The mage flashed him a smile as if he knew exactly what he was thinking. Perhaps he did. Nirwain, known to most only as the Spider, acquired a taste for bright and elaborate robes during his time in Hoeth, and many of their fellows frowned upon him for it. No one complained aloud though. Spiders tend to be poisonous. When my mother-in-law (she loves the WH miniatures and fantasy in general) first saw the Shadow Warriors occupying my worktable, she exclaimed: "Oh, how cute! These are the little Elves who live in the woods, are they not?" More or less, they are, but please do not tell them. And then there is a Shadow Prince. There has to be one. This Shadow Prince held the title even before Headshot posted his glorious narratives to this site. One day, he will be called Nár, the Flame. Shadow Warriors, Ahtaril is second from the left side. Nirwain Nightwalker, known as the Spider. ...so now he wields a broken Phoenix Guard halberd in battle. Next time I am back to Dragons... and riders. The black Eagle Claw Bolt Thrower is stunning. The new PG are so much better than the old ones too, they're just bulkier and look as if they COULD have a 4+ ward save. That BSB is great too, and so is the druchii, though it's a shame how the army was handled. That battle sounds...interesting. Bad for the enemy, but good for your side. Shame about the DE player. Those Shadow Warriors are great too! The Mage conversion is nicely executed, and the Shadow Prince is perfected painted. I just wish Headshot would come back to the site and do another story. Well he might do sometime. Umm... I don't think that's a dragon. No, that's Caledorian Steed. Great for reading. It seems I am learning, Elithmar. When assembling my first batch of models, I was hopelessly inept, I couldn't even use the plastic glue right. I am almost up to date with the models, soon I will have to actually paint something to show it off. I am glad to hear, it is exactly how I wanted it to look like. And yes, more stories of the Host would be great. ...it's a shame how the army was handled. I think that one should treat warriors with respect. It is only a game, but to see about 5000 points of DE lying on one heap in an old battalion box - that is something I will never understand. That's a very fluffy looking dragon, I like it! I love the cloaks you've done, two tone, the green on the outside and blue on the inside, I'm going do do something similar with my Wood Elves, the Mage's cloak is especially nice, the little details on the inside are awesome. That Wood Elf looks amazing with the halberd, it changes the model so much! That Wood Elf looks amazing with the halberd, it changes the model so much! Thanks! I love the model, but the sword just couldn't seem to fit. And I removed the Wood Elf paraphernalia (read: leaves) just to paint them back in freehand. I promised a dragon, so here she is. No fluff this time. Her name is Ningor, the Snowstorm. The rider doesn't look very Caledorian to me. Sapherian? Ooo nice cool scheme. I imagine he's from the North of Ulthuan, from some snowly mountain.